RUBIRIZI– Police in Rubirizi confirmed three people dead in an accident along Ishaka-Katunguru road in Rutoto trading center on Tuesday morning after a Fuso Lorry registration number UAZ 442F overturned several times. The accident happened at Rutoto trading center in Rutoto sub county, Bunyaruguru in Rubirizi district. 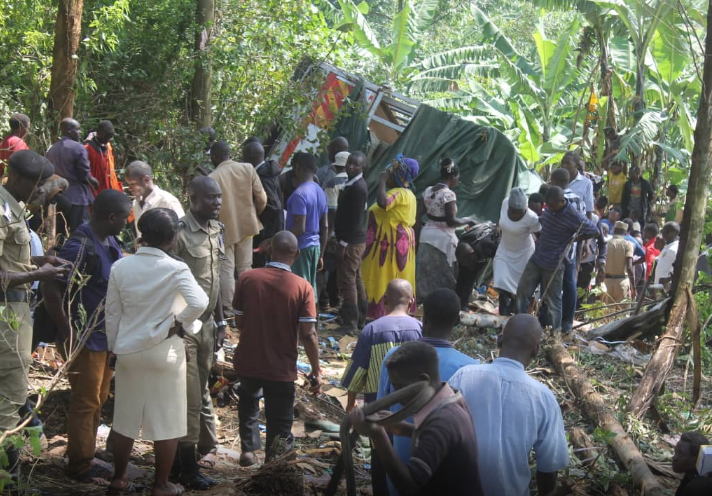 The deceased were identified as Derrick Bwambale 21, Innocent Kahayika 31 both residents of Kasese district and Charles Kigumba 32, who was the driver of the lorry. Addressing on the matter, the Rubirizi district police Commander Ahmed Hasunira said, a Fuso lorry carrying bicycle spare parts overturned several times after developing a mechanical problem while climbing Nkombe hill. Mr. Hasunira warned the drivers to respect traffic rules and always assess the mechanical conditions of their vehicles before driving especially long distances to avoid such incidents. He said Ishaka road in now in poor state, being under construction, asking drivers to take note. “Ishaka-Katunguru road is now under construction so drivers should be careful and respect traffic rules,” said Hasunira. The deceased were taken to Rugazi health centre IV for postmortem.